I think this has been my toughest special order yet. The card is for a friend of my mom's - a gentleman who has decided to discontinue the treatment of his brain tumour and live out the remaining few months of his life without suffering through further chemo or radiation. Whoa. A huge decision and I have such admiration for the choice he has made. She asked me to use this specific sentiment and, given that he worked for Sail Training International, she wanted sailing to feature on it. My mom admired this card so I decided to CASE it as I was pretty unsure where to go with an order like this. Thankfully she is really pleased with it and I hope that her friend's remaining days are as peaceful and full of love as possible. I thought of the CAS-ual Fridays challenge to make a masculine card using designer paper when I made this but I dithered about whether entering was appropriate given the nature of the card. My mom gave her blessing though and said that if it meant that maybe some other people would send good wishes his way than that couldn't be a bad thing. Jen, such a hard card to make, but you did an absolutely wonderful job. It is soft and serene and the message can be felt in the gentle waves. I'm sure he will really appreciate it. Prayers for peace are being sent his way. Wow! A beautiful card for a tough situation. You know there are times when I question the 'importance' of our craft, but what's really important is the thoughts and prayers that our cards convey to the recipients - I'm sure this one will be appreciated. What a tough but brave decision to make! I know he will love this card you've made. You've done an amazing job with it. Hugs. What a really great card for a really hard decision. I love the rolling sea Jen, it is in itself, very peaceful to look at. This card is perfect! He will just love it! Jen, this is a beautiful card, absolutely perfect for your mom's friend. The story has made me sad (and brought back memories). I hope he has a peaceful journey, and he is in my thoughts. This card is so moving Jen. The sentiment and images are just right for such a difficult situation. Peaceful thoughts and prayers for the card's recipient. Wow, what a brave guy to make such a decision... he must be totally at peace with himself. what a gorgeous card, so peaceful and serene. I think you totally nailed this difficult one. What a difficult card to make, but you've done it beautifully. 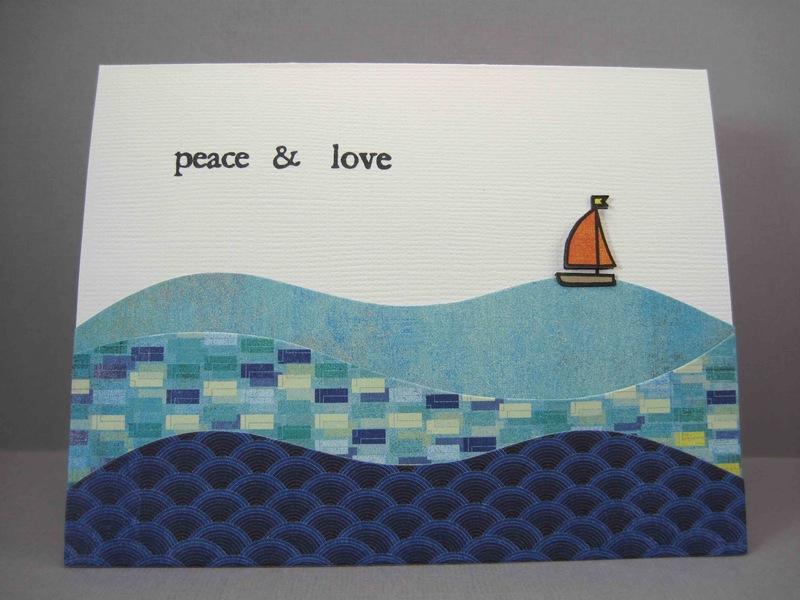 The patterned waves are so serene, and the single sailboat is so poignant. Best wishes to your mom's friend for peace in the days ahead. beautifully done jen. i think it is pure perfection. it can be so hard to create for such a situation, but I'm sure he will treasure it. Lovely card, and a lovely sentiment - very appropriate for a difficult time. What a difficult decision to make, and with that in mind, I know how tough it would be to make something. I do love how it turned out. Blues are so soothing, and the sentiment is really the perfect supportive thing to say. What a great card, and a tough post. I admire your mother's friend, and wish him a peace and love. It is good that he has supportive friends. Simply lovely, Jen - this card just radiates peace of mind. And, what a story. A reminder to appreciate every day that we have. You are so wonderful to be a part of providing some happiness in this difficult situation - this card will bring a smile, for sure! Beautiful card for a tough situation, Jen. I pray this gentleman has peace and comfort in his decision. Beautiful card for such a sad situation. I'm sure it will touch his heart. I'm sending out a loving prayer of comfort. Jen, this is beautiful. So wonderful in it's design, but more importantly it was obviously made with great respect and affection. My prayers are with your Mom's friend. He is so brave. Awesome card and sooooo creative with those patterned paper waves! Love it! Thanks so much for playing along with us this week at CAS-ual Fridays! Jen what a fantastic card, the patterned paper waves are so creative. For such a strong, courageous decision, a card like this will be a blessing. You nailed it. I'm so glad you joined us for CAS-ual Fridays, even if the occasion was sad. Such a sweet, serene little card. Love it!